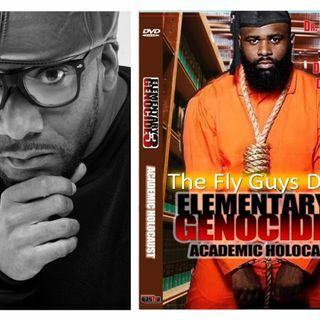 The Fly Guys, Sheena Boston & DJ Seko Varner "The Edutainer" (@GrandpaCrunk), discuss the release of Elementary Genocide #3 with filmmaker Raheim Shabazz. During the discussion topics such as bootleggers, the need for the film, how educators can assist the Public School to Prison Pipeline, and the struggles in making the series of films. Background music from the artist 'Grandpa Crunk' adds to the episode. Shabazz's company, Rasha Entertainment, has been in the ... See More video production industry for over 10 years. In the last 3 years, they produced two award winning documentaries titled, “Elementary Genocide: The School To Prison Pipeline & “Elementary Genocide 2: The Board of Education vs The Board of Incarceration”. Our company is independently owned, and in order to protect our independence, we never accept funds from corporate sponsors.Each film project has been funded out of the pocket of executive producer, Rahiem Shabazz. Elementary Genocide 3: Academic Holocaust is the latest installment in the award winning documentary series. The film seeks to explore how the "Murder In The Streets, Same As Intellectual Murder In The Classroom". The documentary features notables such as Prof. James Small, Kaba Keme, David Banner, Shahrazad Ali, Michael Imhotep and many more. Music: After all that Barkardi - Grandpa Crunk, Crunk's Groove - Grandpa Crunk, One in a million - Grandpa Crunk.